If you haven’t read the first part of this story, read it here. I hid behind my bed on Thursday morning. Mummy was calling for me and sounding very worried when she got up. I waited until she’d been all over the house looking for me, then poked my head out so she could see me. I know I needed my booboo fixing so I let her pick me up when it was time to carry me to my box, and I went all limp and didn’t fight her at all. Going in the noisy big metal box that rolls and roars was not fun. I don’t like it at the best of times, but sliding around in my little plastic box so my wound hurt even more made it very unpleasant. I cried quite a bit, but mummy kept making soothing noises until I calmed down. When we got to the vet, I stayed as close to mummy as I could. The vet was nice, but I wanted to stay with mummy. I got lots of cuddles from mummy whilst the vet checked me over. They kept me in and did all sorts of things to my side. It wasn’t nice, but I was very brave so they didn’t have to give me the sleepy floaty stuff they did when they stole my bits. 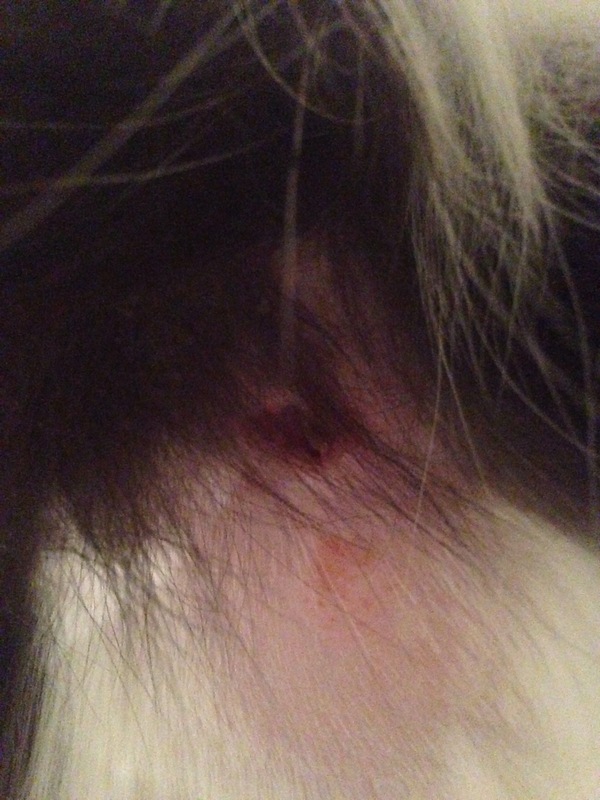 I hadn’t licked my wound after the vet cleaned it, so I heard them say I wouldn’t have to have a cone. I didn’t know what a cone was and thought it sounded like something I might like (I was wrong) so I licked my side just before we left. The vet gave a big plastic thing to mummy to take home with me. When I got home, I got lots of attention and had some food. 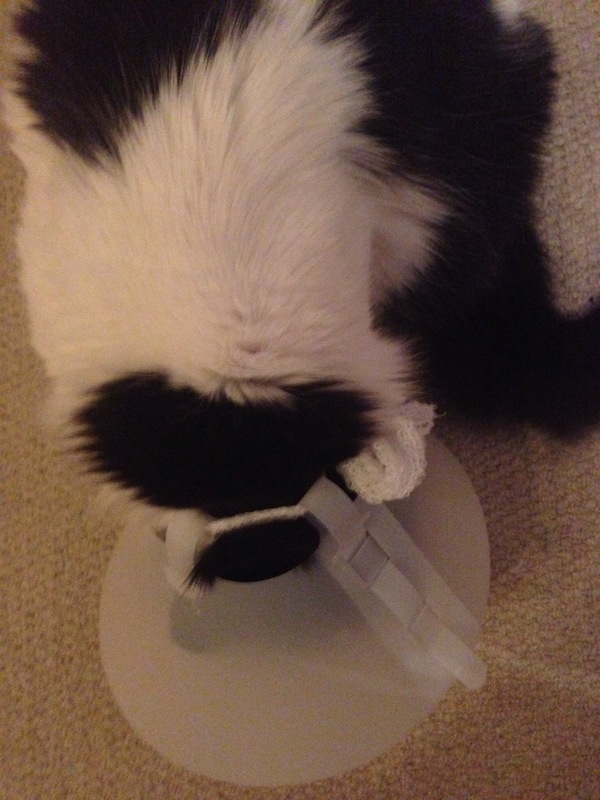 Then I discovered what the cone was. It was NOT a giant treat or toy as I had hoped. Just as I was enjoying daddy cuddling me, mummy came and wrapped the big plastic thing round my head and tied it on. I tried so hard to get it off and kept bashing it into things, but it was no use. In the end I sat with my head down feeling very sorry for myself for quite some time. Then the night time happened. Mummy had gone to bed early, as she’d hardly slept the night before. I was trying to get comfortable in my cone when I suddenly felt very poorly. Lots of orange goopy mess started coming out of my mouth and I couldn’t control it. Mummy must have heard the wretching and my cone bashing into the walls as I tried to get downstairs, as she got up. I thought she might be cross at all the mess I’d made, but she stroked me and cleaned the yucky stuff from inside the cone. Mummy came down and tried to sleep on the sofa to keep me company. I did my best to get comfortable with her, but it was just so uncomfortable in my cone. Then I was sick again. This time it was more liquidy. Mummy got me to the kitchen before most of it came up, but it went all over my cone and dripped down my tummy. Mummy cleaned it as best she could, but I didn’t like the cone even more with it being all dirty. I backed myself down the side of the sofa to try to get the cone off, but I got stuck. Mummy said she gave up and she took the cone off. I ran and hid under the sofa before she could change her mind and put it back on. Mummy went to bed saying there was no point staying up if I was hiding, so I went to sleep. Me and mummy were very tired on Friday. I heard mummy call the vets and later I heard her tell daddy they had told her to just keep an eye on me, as it could have been a reaction to stress or the antibiotics that was making me throw up, and that she should wait until I was keeping my food down before giving me more medicine. I was disappointed, as I’d seen the vet give mummy medicine for me and I’d been looking forward to all the biting fun that would provide. Hehehehehe. I wasn’t sick again on Friday and had quite a nice day sleeping. Saturday started ok, although mummy did squirt medicine in my mouth and it tasted funny. I was very good and didn’t spit it out though. Then mummy and daddy went out. I was just having a nice sleep in the afternoon when the orange stuff started coming up again. I was not happy. I’d only been sick once by the time they got back, but it had happened twice more by the following morning. Mummy didn’t give me more squirty stuff, as she said she thought that was what was making me sick. I was sick another three times on Sunday night. Mummy must have been ever so happy, as there were so many stains to use her new machine on. I’d been sick everywhere that I usually sleep, so I’d made an awesome discovery. Mummy’s new office chair is so comfortable! I was sick off the side of it, but it was so high that I could keep sleeping there. It’s now mine, although mummy seems to disagree. I’ll cut the story off there for now and come back on tomorrow (when mummy thinks I’m just asleep in her chair) to finish it. Silly mummy.